GENERAL INFORMATION - GT TOURS INC. Comprising almost the entire southern half of South America, Argentina is the world’s eighth largest country, covering an area of 2.8 million square km. The country has some of the world’s tallest mountains, expansive deserts, glaciers, forests and pampas, jungles, impressive waterfalls, bucolic rivers and a sea coast with huge beaches and a rich marine life. The diversity of the land ranges from wild, remote areas in southern Patagonia to the bustling metropolis of Buenos Aires in the middle… Visiting Argentina is a soul-stirring experience. It is an essential journey. From the cafes of Buenos Aires, where impassioned tango dancers swirl through the night, to the grand peaks of the Andes, towering magnificently over the central valleys, and from the breathtaking wilderness of deepest Patagonia to the legendary open-pit barbecues of the north, Argentina offers an experience unmatched anywhere in the world. Lovers of the outdoors will come for the mountains and lakes, the coast and the valleys, where they can hike, trek and fish. Argentina is a diverse, welcoming land, and a pleasure to visit year-round. Lovers of good food will explore the labyrinth of old Buenos Aires, where the culinary legacies of Spanish, Italians and gauchos collide unforgettably. Those with romantic hearts will find passion in the tango cafes and streets of Buenos Aires, a European capital in the heart of South America. Every sensation in one nation: Argentina. Buenos Aires is the doorway to the cosmopolitan South America and home to the Tango. Modern, dynamic and traditional, the city exhibits the mixed essence of the Argentineans. A bohemian and energetic environment is also well kept within some memorable corners, in many typical neighborhoods and in the most sophisticated restaurants and bars spread all over the city. Buenos Aires is an amazing destination waiting to be discovered. The city, located on the shores of The Nahuel Huapi Lake and among mountains and forests, is always showing a changing landscape that adapts to each season along the year. In the surroundings, the Andes mountain range exhibits its greatness while at the same time, ancient and silent forests extend along the crystal clear lakes. Skiing, trekking, sailing or just relaxing, are all possible in Bariloche. Great in beauty and small in size, this is the city of the Glaciers par excellence and invites those tourists fond of adventures, quietness, culture and nature. El Calafate is surrounded by mountains, granite peaks and snow fields that spread as glaciers into picturesque lakes offering visitors unique sceneries. Here you will find yourself at the gateway to the majestic world of the glaciers. This town is near Argentino Lake which has great mysterious depths, like all lakes originated from glaciers. Located in the northern area of Los Glaciares National Park, it is the worldwide ideal destination for climbers and explorers. The mountain range presents many challenging mountains such as the Fitz Roy, Torre, Poincenot, Aguja, Egger, and others where the climbers can follow self-guided foot-paths. You can also be guided by specialized guides in mountain climbing and ice trekking, for it is also possible to have access to the Continental Ice Field, this expeditions are for expert climbers. Located 225 km from El Calafate, this particular destination is an excellent place to enjoy nature in its forests and mountains. El Chaltén is known as the “trekking capital” and the recommended season to visit this place is from October to April. To the south, Tierra del Fuego -the Land of Fire, in English-, and the capital of that Province, Ushuaia are an open gate to the immense and mysterious solitude of the Antarctica. Ushuaia, a destination that once was a wild and remote place, today attracts thousands of people from all over the world who seek to be dazzled by breathtaking landscapes. This touristic city in essence, does not distinguish seasons. Adventure, excitement, history and legends come together in this island along the year. Ushuaia is a picturesque city with an important tourist services infrastructure, an elegant commercial center and an increasing social and cultural activity. In its surroundings, Ushuaia offers unexplored untouched territories that invite visitors to discovery and adventure. Situated on the wild southeast coast of Patagonia, Nature reigns supreme. The Valdez Peninsula is home to thousands of penguins and sea lions, while dolphins and whales can sometimes be seen offshore. A deep water port, a commercial center, and a tourism destination, Puerto Madryn is a popular resort destination for beaches, sports and wildlife excursions. This beautiful scenery made up of exuberant vegetation, surrounds great rivers, a red-colored land and the untouched jungle covered by prominent trees and full of extraordinary flora and fauna. The great Iguazu Falls – Great Waters, in Guarani Language- are a unique and imposing wonder that exceed the senses and lie beyond our understanding and conforms one of the highlights in the country. The time seems to have stopped in this land crossed by canyons, ravines and mountains, sometimes colorful, others, painted in just one color, but in general, covered with cactus. There is a contrast of weathers, from the arid and deserted hills to the humid and full of forests valleys but in general, exhibiting Pre-Columbine vestiges, ruins of forts and small towns with a mixture of natives’ and Spanish constructions resisting the passing of time.. The Hispanic architecture of the city outstands from the other cities in the country. The colonial spirit from the times of the foundation remains in its houses, streets, hundred-year-old monuments and narrow sidewalks surrounded by the mountains nearby. This is the northernmost province in the country with the greatest Indian population, whose main activity is agriculture. San Salvador de Jujuy is known as “the little cup of Argentina”, as it is located in a valley surrounded by mountains. 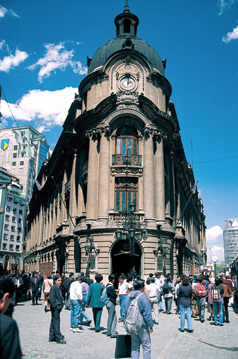 You can visit the Cabildo, the Cathedral, the Historic Museum and the Museum of Sacred Art decorated with paintings, which were brought from el Alto Peru (the name for Bolivia until its independence in 1825). This is the smallest province in the country. San Miguel de Tucumán. Capital of the province. Its main attraction is the Casa Histórica de Tucumán (historical house) or Casa de la Independencia, where the independence of the country was declared on 9th July 1816. There is a light and sound show in its patios every night. It is the most modern city of the northern provinces, although some relics are found in the churches and museums, like the Nicolás Avellaneda house, former president of the Republic; and the house of bishop Colombres in Parque Centerario 9 de Julio, the first sugar refinery in the province and one of the main economic resources of the area. In a half-day tour, you can visit San Javier Hills and Villa Nogues, a residential area of the city. Cuyo – “the land of the desert”, in the natives’ language – the region where Mendoza is located, is the land of the high peaks, the snowy volcanoes and the endless adventures going from the Andes and the Pre-Andean Mountains to the savannah-like lands. In the valleys and among the vineyards, farms and cellars, one can follow the Road of the Wine and taste the internationally recognized elixir. Mendoza, the land of the sunshine and good wine is a province to be visited all the year around. Famous for lodging Aconcagua Mountain and for its Malbec wines. Cultural and touristic; historic and modern; industrial and traditional; Cordoba is one of the most important economic centers in the country. A benign weather and a mountainous scenery, valleys, high plateaus and deep ravines, monuments dating back to the Spanish colonial time, towns, historical remains and rock paintings, all of them are combined in such a way that creates a very special and unique environment. This beautiful city is open to tourism not only through its history but also by means of its impressive sceneries, with plenty of eye-catching sites and various surprises for visitors. Its streets and promenades feature tracks of the ancient colonial architecture mingled with modern buildings. All this is completed with parks and green spaces such as Sarmiento Park.